Spiritual faith has long been shaped by the lettering on a religion’s sacred texts. This is particularly the case with Judaism, so we visited three Hebrew scribes—in Jerusalem, New York City, and the liberal enclave of Berkeley, California—to understand why such laborious traditions continue. Rabbi Shimon Zeide is a Hebrew scribe in Brooklyn, New York. As old-world as his profession sounds, it remains alive and well here. The pinnacle of a scribe's work, an exquisitely lettered Torah, can cost upwards of $100,000. Photo by Bryce T. Bauer. It’s about halfway through our first interview when Rabbi Shimon Zeide decides his best option is to just start scribbling. This, I wager, is unusual. Zeide, a Hebrew scribe with nearly thirty years’ experience, is the proprietor of the sofrus supply shop and scribal studio Merkaz Hasofrim, in Brooklyn, N.Y., and he has taught, by his own estimate, over 200 students the art of scribal craft. He definitely doesn’t show them how to scribble. Along the streets around Zeide’s shop, in an area that’s been referred to as the Williamsburg shtetl, Hebrew script is everywhere: on shop windows, school buses, ambulance stations, and sign posts. It all harkens to the passersby—the men and women in long coats and dresses of such a consistently dark palate that they stand out, even a city where black apparel seems to be the unifying fashion. Yet, he’s scribbling. First, out of a swift series of chicken scratches comes the Hebrew letter shin. Then he scribbles some more: an alef. Each takes just a few seconds to make; half, maybe a quarter even, of the time he took to write the letters earlier, when I first arrived and he was showing me how to do it right. He’s trying to make a point; trying to answer a question that I’ve been asking, and struggling to understand, in some form, many forms, since I entered his shop thirty minutes earlier. It’s not a particularly decorous question, but it is an obvious one: what is the point of all this—of the letters that take nearly a half minute to write apiece, done with hand-cut quills on calf-leather parchment that costs, on a square inch basis, something like 100x more than even an extravagant Moleskine? All of which can add up, for a particularly exquisite Torah, like the pocket one Zeide was working on when I visited, to $100,000. It’s a question made more confounding by the fact that the space I’m standing in seems utterly incongruous to the world I’ve entered. Merkaz Hasofrim is located in the Orthodox neighborhood of Williamsburg, and until the moment I’d crossed the threshold, I’d been expecting to arrive in something like an old-world atelier. Something perhaps a little dark and a little dank, its windows coated with hoar-frost like dust. Definitely, there’d be parchment stacked everywhere. This expectation was reinforced on each of the several blocks I walked after exiting Brooklyn’s Marcy Avenue subway station. Rabbi Zeide’s shop sits in Williamsburg, Brooklyn, one of two neighborhoods in Brooklyn (the other being Crown Heights) where Orthodox Jews have built traditional communities. Photo by Bryce T. Bauer. Away from the telegenic blocks of craft-cocktail lounges and art galleries and metal-and-glass new builds—those frequently evoked symbols of Brooklyn’s new gentrified urbanism and hipster cool—that has made the neighborhood’s northern region world-famous, this section of Williamsburg seems, to the outsider at least, almost monotonous. Along the streets around Merkaz Hasofrim, in an area that’s been referred to as the Williamsburg shtetl, Hebrew script is everywhere: on shop windows, school buses, ambulance stations, and sign posts, all harkening to the passersby—the men and women, frequently pushing a stroller, who are dressed in long coats and dresses of such a consistently dark palate that they stand out in a city where preference for black apparel seems one of the few strands of unification. With Jews, traditional tends to mean conservative, even politically. In the 2016 presidential election, the district that contains Zeide’s shop went for Donald Trump by 58 percent, creating one of the few specks of red in New York City’s sea of blue. Photo by Bryce T. Bauer. Even the row-house that holds Merkaz Hasofrim, with its jerry-rigged buzzer system for a door that doesn’t appear to lock, seems to be in character. But when I walk into the shop itself, it is bright, almost gleaming, with the reflective sheen off a new floor and pristine white walls, the result of a recent renovation. In a different part of town the space would probably be a dentist’s office. It’s definitely not a place stuck in time. Why would Orthodox Jews care more about penmanship than almost anyone else? The answer, I soon learn, has to do with the nature and components of meaning. When we settle into Zeide’s studio, in a room with three sofer tables, Zeide begins demonstrating his craft by cutting a writing quill from a turkey feather. Merkaz Hasofrim sells both pre-cut quills and uncut feathers, which they usually get from Europe, where the turkeys are allowed to grow larger than they are in America. As he whittles, Zeide explains the religious underpinnings of scribal work. The rules of sofrus, he tells me, derive from Jewish law, which dictates that certain Hebrew texts must be written by hand in accordance with a long series of Judaic regulations. These texts are the tefillin (writings put in leather boxes, which are strapped to the arm during prayer); the Torah (the Jewish bible, commonly referred to by Christians as the Old Testament); and the mezuzah (a short selection from the Torah, enclosed in a small box that is attached to the doorways of observant homes). One of these regulations says the scribe has to have intention, or awareness, that what’s being written is holy. A machine cannot have intention, so a machine cannot do the writing. The materials for a Torah scroll run between $5,000 and $6,000. One sheet alone of the calf-skin parchment costs close to $100. Photo by Bryce T. Bauer. Later, Zeide shows me a fountain pen with a ceramic tip for scribes who don’t want to cut their own quills. Zeide says that hand-cutting quills is one of the hardest skills to learn—a sentiment that one of his former students echoes during a subsequent visit. The effort has its rewards, however. 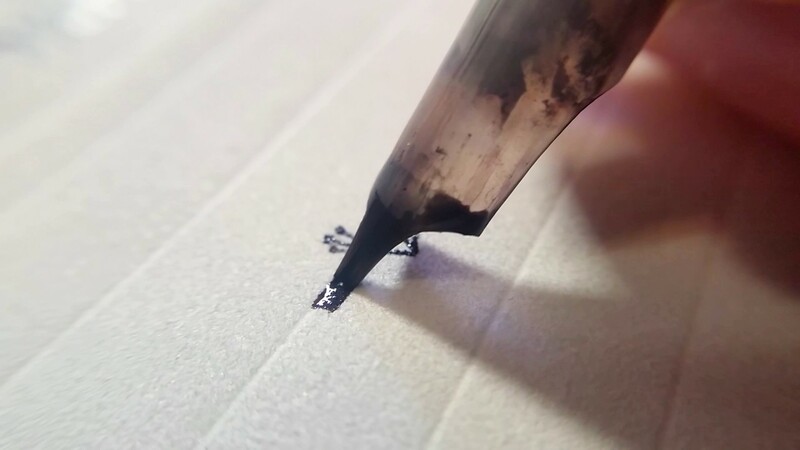 Making one’s own quill allows the scribe to cut a tip to dimensions that perfectly match the size of letters he wants to write. Furthermore, the tip of a hand-made quill can be re-sharpened as needed, typically about a dozen times. Scribes not only have to use quills instead of metal pens, they must also know how to re-sharpen them, which is done by essentially whittling the tip with a sharp knife. Photo by Bryce T. Bauer. Each letter also has its own set of rules, Zeide tells me as he flips through a book in Hebrew; the book describes the requirements for each letter and what to do if a mistake is made. The book is the size of a literary novel, but this apparently is only the abridged version. Most texts also have to be written in order, so if a mistake is made and not caught immediately, the scribe has to start over. Unless, that is, one has written the name of God. The result is a set of handmade quills, perfectly sized to every document. Photo by Todd Oppenheimer. There are only 22 letters in the Hebrew language, but the instructions for how a scribe must write them fill a bible-sized book. For each letter, numerous regulations describe where the quill strokes must begin and end, which one comes first, why, and so on. No wonder Rabbi Dov Laimon still feels some “trepidation” before he begins each day’s work. “But once I plunge in,” he says, “I swim.” Photo by Todd Oppenheimer. Zeide began studying to be a scribe in his late teens, in Israel, on suggestion of his mother, who noticed that he liked to draw. The job appealed to him for two reasons: it could be done part-time, while he was still studying at religious school; and it was a career that seemed to offer some job security. “It’s one of the things, I always say, that God gave us such a law that it had to be handwritten, because with today’s technology, if we were able to do it with a computer, we’d be out of business,” he says. In the classes Zeide teaches, aspiring scribes typically begin with 15 to 20 lessons, twice a week, each lesson focusing on just one or two letters. To become proficient enough to make salable work typically takes a year. In addition to learning how to make Hebrew letters, students also must obtain rabbinical certification proving that they understand the laws governing the overall craft. To illustrate how fine those points of law can be, Zeide grabs his quill and writes another shin. This time, he makes a small mistake, one that can be fixed with a bit of erasing, which he does. Visually, then, he says the letter looks correct. But it is not kosher. According to traditional Jewish law, only men are obligated, and permitted, to pray with tefillin. And, since only those who wear tefillin can become scribes, women cannot become scribes. “The bible says it has to be written,” he says. “This is not written, it has been scratched. So basically you could see it, it looks very nice, it has all the details, but it’s not valid.” Assessing validity is another one of the scribe’s important jobs, but one where technology can serve as an aid: for the last couple decades, scribes have been allowed to use a computer program that can take a scanned piece of written parchment and analyze whether the words and letters are written correctly. All that said, despite the novel-length rule book and the year-long practice, Jewish law does not require the writing to actually be good. “In order to make it kosher, I would say, you don’t need so much skills,” Zeide says. Hence those scribbled letters: they are kosher, but not good. As long as they are careful, scribes are allowed to erase their mistakes (as long as God’s name has not yet been included). Because the parchment is a form of leather, the erasures must be done with surgical knives, made for this work in 20 different sizes and styles. Photo by Todd Oppenheimer. Perhaps it’s because I can’t get the design of the room out of my head, but I want to ask the customer if one chooses a sofer like one chooses, say, a dentist—a task New Yorkers devote themselves to with more energy, and more resultant grief, than they do even to dating. Before I get a chance, Merkaz Hasofrim starts to fill up with customers, so I decide to let Zeide work and excuse myself with plans to return another day. It’s only later that the root of my question becomes clear to me. What I want to know is, if being kosher has so little to do with craft, then why fuss over, and go to so much expense for, exquisitely written texts? Why, in other words, would Orthodox Jews care more about penmanship than almost anyone else? The answer, I soon learn from my fellow correspondents, has to do with the nature and components of meaning. Some scribal work must be written in infinitesimally small lettering. These texts are particularly suited to the observant Jew who travels, and likes to carry a pocket-sized Torah. Photo by Bryce T. Bauer. Half a world away, in Arnona, a suburb of Jerusalem where holy Hebrew texts dating to 408 BCE have been found in local caves, Dov Laimon continues Judaism’s scribal arts, albeit with a decidedly modern bent. Born in western Canada, Laimon was raised in a secular Jewish family and majored in English literature, at the University of Saskatchewan. At age 22, he became a baal teshuva, meaning one who has returned to the tradition; he soon immigrated to Israel and was ordained as a rabbi. Although Laimon has become a member of Jerusalem’s Haredi community—a group of unusually strict Orthodox Jews who often distance themselves from the modern world—Laimon embraces the outside world. He has long maintained his subscription to The New York Review of Books. He uses the Internet, and even has a website (see below). His wife calls him “a bridge person.” For the last 15 years, that bridge has included teaching the scribal arts at an institution, called Pardes, that his fellow congregants would refuse to enter. Pardes is a non-denominational Jewish learning center, whose membership includes women and non-religious men. Jennifer Kamenetz, a converted Orthodox Jew in Berkeley, Calif., is one of the world’s few females to become a Jewish scribe. In traditional Jewish law, women are forbidden from becoming scribes. The reasoning is a little circular. Women are assumed to be occupied caring for children, so they are exempt from the demanding rules and prayer schedule required of Orthodox men. And only those obligated to read and study these sacred texts are permitted to write them.. Photo by Todd Oppenheimer. This seems like a classic case of gender discrimination, but most Orthodox Jews—even Jewish women—do not see the restriction this way. It’s a purely practical matter. Men who wear tefillin must pray at specific times every day. Since women have long been responsible for children in traditional Jewish society, it has been considered only fair to free them from such rigid extra duties. As Zeide puts it, Jewish women “have their own obligations, even more than us.” Rabbi Laimon, however, supports teaching women the scribal arts, as a way to bring them closer to the Divine. For a break from his scribal work in Jerusalem, Rabbi Dov Laimon enjoys a moment with his granddaughter. ''Any skill,'' Laimon says, ''anything where a person uses his hands, which is focusing, is beneficial for the soul and for the mind.'' Photo courtesy of Dov Laimon. When I return for my second visit to Zeide’s shop, it is teeming with men looking through dozens of megillah ahead of the upcoming Purim holiday. To obtain some quiet, Zeide takes me back to a small room where he stores dozens of rolled-up of pieces of calf-skin parchment, one of the products he uses, and sells. During my first visit, Zeide had explained what makes for quality parchment. Scribal parchment, some of which is made right here in Brooklyn, comes from the skin on a calf’s back (parchment must be thin so the animals have to be young; some of the best comes, in fact, from fetuses found in utero when adult cows are slaughtered). The parchment comes either lined or unlined; to make the former, Zeide bought a $10,000 computerized machine (apparently another permissible piece of technology), which sets the spacing between lines to within a half-millimeter of accuracy. This precision is critical because some texts, such as the tiny scrolls that go inside mezuzah, are miniscule. A ketuba, a traditional Jewish wedding contract, lettered by Dov Laimon. Photo courtesy of Dov Laimon. As I am talking with Zeide, one of his students, Rabbi Aaron Silberman, drops by to get help with his quill. Silberman’s grandfather was also a scribe and one aspect of the trade that attracted him was that he could take it anywhere. As Zeide works on his quill, Silberman asks if the article I’m working on is like a “free advertisement.” As I laugh off the question, Zeide jumps in with an answer. Dov Laimon’s rendering of one of the most profound words in the Hebrew language: shalom, which means many things — not only peace but also harmony, completeness, prosperity, and tranquility. Photo courtesy of Dov Laimon. “I will a little bit correct this,” Silberman adds. “It’s two different products.” Zeide and Silberman point out that after a man buys a tefillin, he’ll keep it for life—unlike, say, a piece of clothing. “Your hat, suit, and coat, you have to change it quite often,” Zeide says. “So when you compare the price you pay for good-quality tefillin, for everyday use, it is cheaper than everything. The only reason why people are not spending a lot of money, is because they don’t understand,” Zeide says. Read Ali Eteraz's fascinating investigation of what computerization does to an old Persian script -- and see how artists are pushing the boundaries of scribal work. They're all here in our sidebar: "Hebrew Scribal Arts: a Resource Guide"
His point, as I gather it, is this: If a scribe can’t be bothered to do exquisite work on high-quality materials, if he’s just out to finish the job quickly, then why wouldn’t he slouch on the intangible steps that also go into making a product kosher? “We have to know, is he a trustable guy?” Zeide says. In this world, then, quality is not just a job well done. It is also a signal of trustworthiness, an assurance that a religiously significant object can match the quality of a buyer’s faith. Lynn Holstein is a writer and administrator living in Israel, and the author of “Transcending Tradition: 40 Artisans of Israel,” which will be published in the fall of 2017. Ali Eteraz, a lawyer, is the author of the novel, “Native Believer,” and the former managing editor of Craftsmanship Quarterly.